nSearch Global Pte Ltd is a Ministry of Manpower licensed recruitment and Employment consulting agency, headquartered in Singapore with offices in Malaysia and Thailand. Established in 2008, we have grown into a leading recruitment agency for medium and large global companies, providing valuable advice and services to meet their needs. In today’s fast-paced industry, finding a good fit for your company may be time-consuming. We believe in providing efficient manpower allocation where our clients are introduced to the right people for the right job, thus allowing you to focus on other important things that matter. nSearch has always followed the Fair Consideration Framework (FCF), which forms part of the Government’s overall effort to promote equal job opportunities. We comply with the Tripartite Standards Guidelines on Fair and Progressive Employment Practices and have fair employment practices that are open, merit-based and non-discriminatory. Led by a management team with a decade of experience in the recruitment industry, we are supported by our core group of professionals with a diverse background in consulting, outsourcing, internet technologies, education, and business industries. We have served clients from the Banking and Finance, Information Technology, Design, Engineering and Manufacturing industries, and the Public Sector. 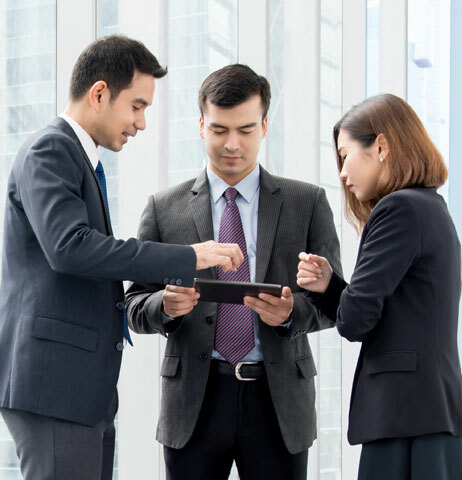 As Singapore’s leading IT services recruitment consultancy, we connect specialist talents with leading employers across multiple industries and disciplines. We are performance driven and what differentiates us is our unwavering commitment to build relationships with our clients. By understanding our clients’ requirements, we are able to meet their needs precisely, allowing organisations and their employees to succeed. Matching the right person to the right job is our core tenet and philosophy at nSearch. We offer a diverse range of experience and insights gained in addressing talent management problems. Our consulting teams comprise a synergetic mix of business and technology competencies, as well as a deep understanding of the different industries and the issues relevant to them. More than just a recruitment agency, our expertise in providing Human Capital Consultancy adds value for our clients. Universally sought after, our recruitment skills and headhunting expertise (in all sectors) are highly beneficial assets for our clients. We pride ourselves as a one-stop human capital solutions provider, and our innovative and relationship-focused workforce solutions are effective across a wide range of industries. We have an established relationship with our different partners across regions and have often drawn upon each other’s recruitment expertise working across Information Technology, Banking and Finance, High-Tech Manufacturing, Healthcare, Public Sector, and Oil & Gas industries. We follow a proven methodology that focuses on the specific needs of our clients’ organisation and industry. Identifying traits from our extensive pool of international and local candidates, we shortlist the best talents who fit your company’s skill requirements and beliefs. Together with our consultants, we offer valuable advice on talents and new compliances in the HR industry. We seek to make our clients’ recruitment and HR functions easier and simpler to ease the burdens of manpower management. As a one-stop HR solutions provider, we address all staffing needs for our clients and streamline their decision-making process for a far more productive business in the long run. Leave administration tasks (payroll, insurance, compensation, etc.) to us and focus on the things that matter.